So my package has arrived ofÂ Yumiko: Curse of the Merch Girl by Murs and Josh Blaylock. If you need it a refresher of what this is then check out the successfully funded Kickstarter page for more information. 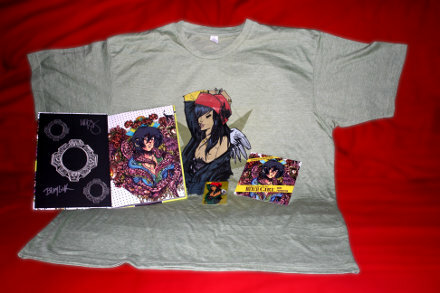 I ordered the package with the T-shirt and picked the art of Jim Mahfood with his envisioning Â of Yumiko. Included in the delivery was a download card with the album and comic digitally, a hard cover of the graphic novel and the Murs & Foundation CD. I was waiting to get the physical comic to read it but it looks great with the artwork of Jose Garcia with a quick flip through. The Murs & Foundation album is just what you thought it would be, nice with all the songs complimenting the graphic novel. Click on the image to see a larger version at Art by Ecliptic Sight.